Primary Admit Card 2019: Download DPE Admit Card for the Directorate of Primary Assistant TeacherJob exam. Exam Date & Time also available here for 64 District. Every candidate can Download the Primary Assistant Teacher Job Exam Admit card from the official website of dpe teletalk com bd. You can also able to download your admit card from our website. Here is the full process for collecting Admit Card. Do you want to download Primary Assistant Teacher Admit Card 2019? So you are entered in the right place. Because the official website of Directorate of Primary Education (DPE) will publish admit card very soon. Everyone can download the admit card and participate in the Job Exam of Govt Primary School Teacher Job. Now it is time to share the full process for collecting the admit card. Read the full article from below and Download Primary Assistant Teacher Admit Card. Now Primary School Teacher Job Exam Admit card available on their official website. Every candidate is very curious about their admit card. Because Govt Primary Assistant Teacher Written exam will be held on ….. 2019. You should download the admit card before the last date of Admit Card Download date. If you don’t know, How To Download Primary Assistant Teacher Admit Card, so don’t worry! Follow our easy and workable way from below and download your admit card. 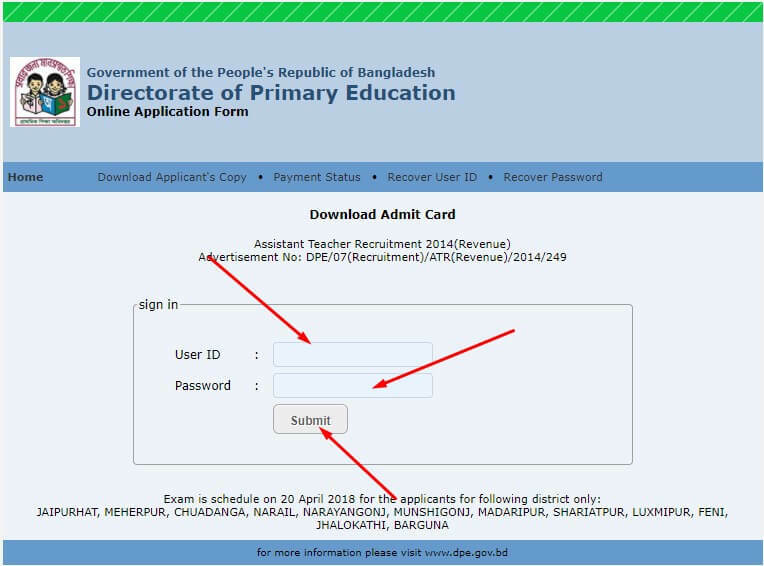 If you want to download your admit card, so you need to visit the official website of Directorate of Primary Education (DPE.gov.bd). Do you know the official website? The official website is www.dpe.teletalk.com.bd (Only for Admit Card). First, visit the official website address to download your admit card. Firstly type your “User ID” in the first box. Then input your “Password” in the next box. Finally, click on “Submit” option. Your Primary School Teacher Admit Card will generate automatically with PDF format. You can able to get your admit card after some seconds. It will take too much time for server loading cause. If you failed on the first time, so apply this method again after some time later. Then Download Primary Teacher Admit Card PDF from official link. I hope you will ask me, why I included Primary Teacher user ID & Password recovery option? It is one of the important topics dear! That’s means ‘Primary Assistant Teacher Job Circular 2019”. This job exam will be held on …… 2019. So if you lost your Primary Teacher User ID & Password, so what to do? It is a common issue. If you lost your User ID & Password so you can’t download your Primary Assistant Teacher Admit. So here is the recovery process for those people who forget their User ID & Password. Follow the simple instruction below to recover your User ID & Password. This process will help you to recover your Password. So now you are the success to recover your User ID & Password, now Download Primary School Teacher Admit Card from below. In Conclusion: Here we have shared Primary School Teacher Admit Card collecting process with Primary Assistant Teacher User ID & Password recovery process. Also, bookmark our website to get Primary Result 2019 very fast than other. We hope you guys successfully understood and gain our content and successful to download your Admit card or success to recover your user id and password. If you like this content, so please try to share it with your friend circle. Thank you so much for being with us. All the best!